At 8:45 AM It was a hot morning. Our Scott Kelby worldwide Photo Walk was experienced all over the world with 1111 walks scheduled and 33,483 registered walkers. 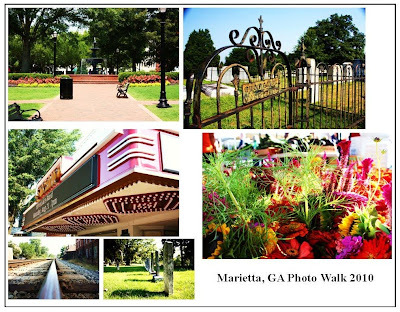 The Marietta Square Farmers Market was taking place so some of the photos are of the vendors and customers. Of course the fountain and the nearby cemetery made the walk and photos too. This photo above is Bee Pollen and you actually eat the little grains you see in the jar. When I got married I held them in my hands. Sunflowers have always been a favorite of mine, if someone sends me flowers, Sunflowers will do just fine. Sunflowers, at least a few stalks are often seen near corn fields or a lone soldier or two in a garden. When I discovered there was a Sunflower Festival just outside Atlanta, in Rutledge, GA the very next day, I knew it was an opportunity I could not pass up. So I packed up my camera, tripod, my daughter and her friend and we headed east to the festival. Not only was it a festival but ten plus acres of sunflowers, row after row, one flower bigger then the next, and tall, my goodness much bigger then I imagined them to be. At times I felt like Alice in Wonderland. And the bees, they were every where but as sweet as honey, buzzing all around just as happy as could “be” amongst the flowers, I don’t think they noticed me creeping through their garden. I took 209 photos in 2 hours wondering through the stalks, in flip flops no less, and that’s the photo I did not get, my feet. They were covered in dust and Georgia red clay, evidence of my wanderings amongst those yellow beauties. I took so many photos, to narrow down to just one most favorite is hard, I loved the one so close up of the bee with bright yellow pollen dust on his fuzzy little back, and the photo with my daughter and her friend out of focus behind a single flower in focus. In the end, scrolling through all 209 photos, the one pictured here, straight out of the camera is my favorite. The blue and yellow are just as the camera captured it. This flower was also one that I saw from a distance, it was a tall one towering above all the others. So, I wondered through the field to get next to it to take a photo, and tall it was, to give you a sense of its height, I’m only 5’4 and I’m looking up from underneath to snap the photo. I think it was the tallest on the farm. When I got home I could not get to my computer fast enough to see what I captured full size. WOW! I was so excited at how clear and vivid the colors turned out, and the sky, was it really that blue? Then, when I looked at the photo full size, there was even more detail, the powdery pollen on the leaves, the fuzzy stalks, the little bug on the left flower that I did not know was there when I took the photo. Of course a bee made the picture too. One more amazing thing made the photo, over the right flower is a small white smudge, it’s the moon. When I was taking the pictures of this flower I tried to capture the moon too, which took several before I got this one. I held the camera and snapped and snapped, I think for the newbie that I am I got a pretty great photo of one of my favorite flowers!